“Between stimulus and response there is a space. 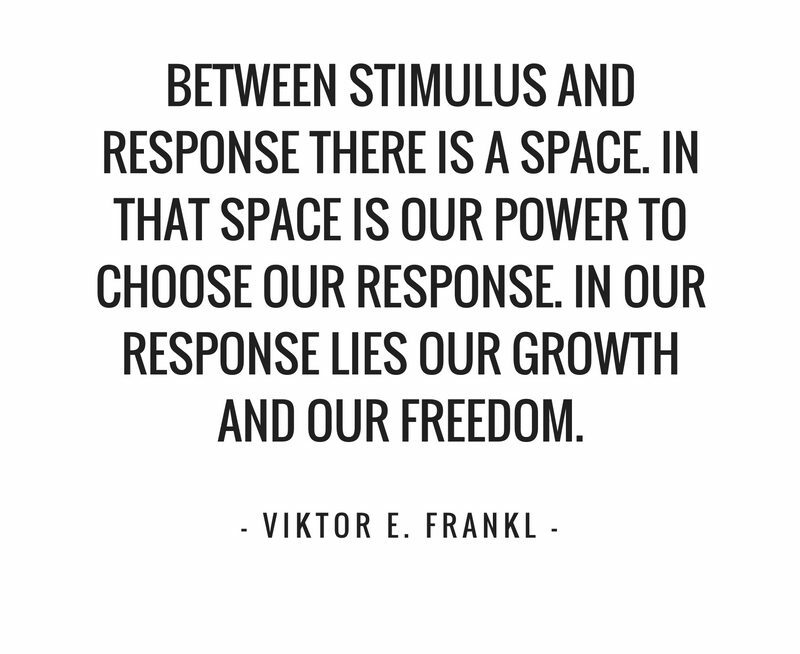 In that space is our power to choose our response.” Viktor Frankl’s wisdom was transmuted in the cauldron of fascist hatred during World War II. He, along with most of his immediate family, were imprisoned in Nazi concentration camps. There, he was subjected to physical abuse and experienced great suffering. His perspective as a psychiatrist enabled him to view the trauma he personally experienced and witnessed all around him with unique eyes. This was the source of his most well-known book, Man’s Search for Meaning, in which he details his time in the concentration camps and his theory about what creates a meaningful life and, ultimately, happiness. It was in these extreme circumstances of deprivation and attempted de-humanization, that Frankl was awakened to powerful truths. One, that love is the greatest aspiration of a human’s life. Two, that meaning is what makes life worth living. And, three, that we have the power to choose our response to any situation. This power to choose is only available when we have the space within to see that such a thing is possible. It is this space that acts as the womb from which our response is born. As with physical gestation, time for conception, development and maturation is absolutely necessary in order to birth a consciously-chosen response. In conventional society, this allowance of time and space is seen as passive and feminine. Certainly, quietude and reflection are considered attributes of the Feminine Principle. Humans of whatever gender can draw upon the symbolism of the womb in seeking to attain growth and freedom. Drawing upon the metaphor of the womb as a guide significantly alters our perception of the nature of power. Venerating the womb and seeing it as a model for an enriching approach to life awakens a culture-wide appreciation for the feminine. Cultivating this powerful wellspring of self-care and expression empowers each person in engaging in life with greater meaning and enlivening purpose. We do not normally associate the words ‘power’ and ‘nurture’ with one another. In my experience the word power is used to describe a car’s engine, an athlete’s ability, or a computer’s functionality. Weapons, fighters, and dominators all rely on power. Nurture, on the other hand, sounds pretty passive and gentle. A nurturer never uses power and we do not expect power to be nurturing. I am proposing to change this. As a storyteller, I have seen and felt the influence that language has on our thoughts, feelings, and actions. I believe that we can shift our expectations when we shift our connotations. If we understand that nurturing and caring are powerful actions, then we begin to see that power can come to mean much more than dominance. This is what Viktor Frankl is telling us – our power to choose is our greatest freedom. It comes from our ability to nurture a spaciousness within where we can care for our feelings and ideas. Within that space, these coalesce and form any number of responses. The space allows us to see which response expresses our nature most faithfully. It is also the source of our strength to embody that response. “I’m spaced out.” In the 70’s and 80’s, I remember that being spacey meant being dreamy and vague, unable to focus on details or be disciplined. I don’t hear that term much these days. I think it has been replaced with “I’m ADHD” or “I’m depressed.” It has become such foreign terrain that many of us simply no longer know what to call it. We have individually and collectively lost our map of this territory, mostly because we do not spend enough time there. Our American society says we are failing if we aren’t ‘doing’ in every moment. This ‘doing addiction’ is perfect for eliminating any possibility of experiencing inner spaciousness. When you look at your life, what do you see as worthy? Do these treasures have a tangible value? Who gets to measure this value? If you are using the measuring stick of mainstream America, you will find yourself limited in what can be considered valuable. You can’t buy a penthouse with inner spaciousness. Not much motivation to skewer the planet for dirty fuels if you value quiet, restorative time spent in undisturbed natural places. Certainly, there are many individuals, and even movements within our society, that point out the wealth of the unseen, the unmeasurable, and the price-less. The dominating cultural paradigm would like you to believe that they are spacey, vague, and irresponsible. If you begin to understand the potency of inner spaciousness no outer conditions can contain you. As is common, we would like to take the shortest path to getting what we seek. There are a variety of paths to choose from, some lengthy, some windy, and some endless. The path that works for me may not be the appropriate one for you. Even so, there are universal principles that we can all draw upon. Empowering Wellness Through Self-Care is an online course that supports participants in taking 5 steps over the course of 21 days to create greater wellbeing. It is all about discovering and nurturing the space within each of us. It introduces 5 wonderfully simple steps that won’t cost you any money to implement. It doesn’t ask for more than 4 minutes a day of your time. It will result in greater happiness and success in your life. Space is our power to choose. The choosing gives us growth and freedom, and that always feels like happiness and success.